Litha, or Midsummer, is a celebration that has been observed for centuries, in one form or another. It is no surprise, then, that there are plenty of myths and legends associated with this time of year. Let's take a look at some of the best known summer solstice folklore. 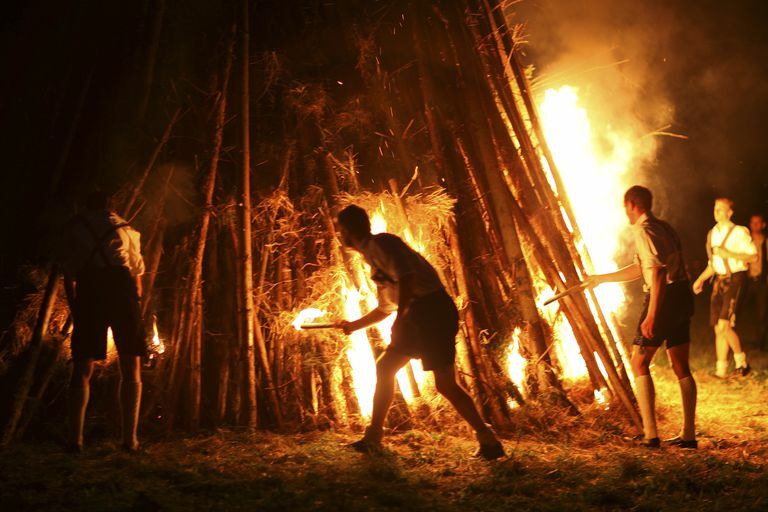 Anna Franklin says in her book Midsummer: Magical Celebrations of the Summer Solstice, that in England, rural villagers built a big bonfire on Midsummer's Eve. This was called "setting the watch," and it was known that the fire would keep evil spirits out of the town. Some farmers would light a fire on their land, and people would wander about, holding torches and lanterns, from one bonfire to another. If you jumped over a bonfire, presumably without lighting your pants on fire, you were guaranteed to have good luck for the coming year. Franklin says that "Men and women danced around the fires, and often jumped through them for good luck; to be blackened by the fire was considered very fortuitous indeed." After your Litha fire has burned out and the ashes gone cold, use them to make a protective amulet. You can do this by carrying them in a small pouch, or kneading them into some soft clay and forming a talisman. In some traditions of Wicca, it is believed that the Midsummer ashes will protect you from misfortune. You can also sow the ashes from your bonfire into your garden, and your crops will be bountiful for the rest of the summer growing season. It is believed in parts of England that if you stay up all night on Midsummer's Eve, sitting in the middle of a stone circle, you will see the Fae. But be careful... carry a bit of rue in your pocket to keep them from harassing you, or turn your jacket inside out to confuse them. If you have to escape the Fae, follow a ley line, and it will lead you to safety. Residents of some areas of Ireland say that if you have something you wish to happen, you "give it to the pebble." Carry a stone in your hand as you circle the Litha bonfire, and whisper your request to the stone. Say things like "heal my mother" or "help me be more courageous," for example. After your third turn around the fire, toss the stone into the flames. Astrologically, the sun is entering Cancer, which is a water sign. Midsummer is not only a time of fire magic, but of water as well. Now is a good time to work magic involving sacred streams and holy wells. If you visit one, be sure to go just before sunrise on Litha, and approach the water from the east, with the rising sun. Circle the well or spring three times, walking deosil–clockwise–and then make an offering of silver coins or pins. Sunwheels were used to celebrate Midsummer in some early European Pagan cultures. A wheel, or sometimes a really big ball of straw, was lit on fire and rolled down a hill into a river. The burned remnants were taken to the local temple and put on display. In Wales, it was believed that if the fire went out before the wheel hit the water, a good crop was guaranteed for the season. "Grimm’s Teutonic Mythology describes the traditional folk practices for Midsummer celebrations in the areas where the Norse Gods were once (and in some cases still are) honored is to set a sunwheel (or a wagon wheel) on fire. In some cases the wheel was simply lit locally and incorporated into the Midsummer bonfire. In other cases people trekked out into the countryside, found a hill, set the sunwheel on fire, and let it roll down the hill as they chased after it, people watching and cheering as they watched it roll along it’s fiery way, as vegetation caught fire." In Egypt, the Midsummer season was associated with the flooding of the Nile River delta. In South America, paper boats are filled with flowers, and then set on fire. They are then sailed down the river, carrying prayers to the gods. In some traditions of modern Paganism, you can get rid of problems by writing them on a piece of paper and dropping them into a moving body of water on Litha. William Shakespeare associated Midsummer with witchcraft in at least three of his plays. A Midsummer Night's Dream, Macbeth, and The Tempest all contain references to magic on the night of the summer solstice.